Mature understanding arises out of seeing the other point of view, and the deepening of wisdom moves towards having less staunch opinions on matters. New experiences test our maturity of wisdom; do we react in a knee-jerk manner and take up a posture, or can we work collaboratively with another to deepen our knowledge? At one level of interpretation, two old men are puttering away their lives on tasks that lack personal meaning or life satisfaction. And indeed many people engage in jobs to pay the rent rather than to fulfil personal dreams. This can so easily lead to a very grim attitude and a grey heart. Yet looking beneath the surface of the task of shoe mending, we can see the need for a keen eye and a sharp intelligence applied to a very specific outcome. The two men are in a working relationship, one that requires a very particular form of reliable communication so that they operate effectively together as a team. Each has their own talents and preferences that blends with the other so that a harmony is achieved and the whole becomes more than the sum of the parts. Individually they would be far less impactful than they are as co-workers. 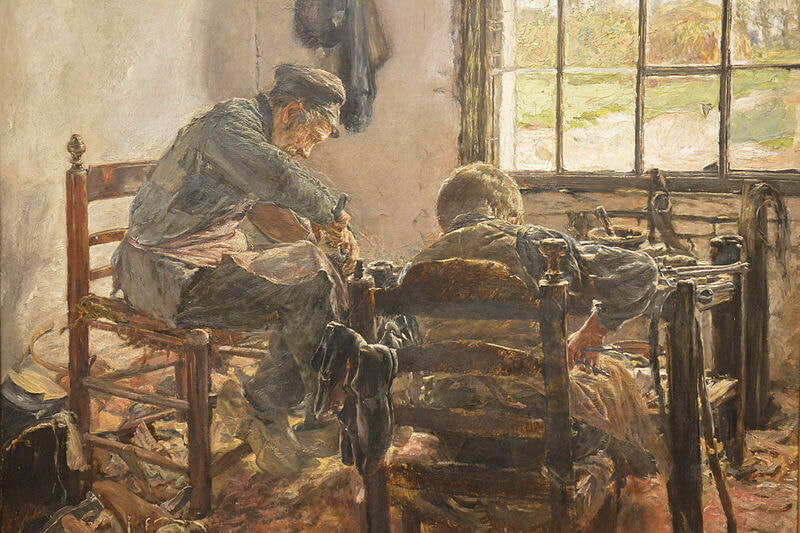 The artisan and workman have a unique and highly respected quality of integrity that is derived by their simple and absolute commitment to performing skilfully the task at hand. This is done by balancing the pros and cons accurately for each of the many aspects of the job – customer liaison, assessment of damage, cost benefit calculation, knowledge of materials, methods, and so on. Taking this metaphor into our normal lives, we see that we gain much if we become capable of calling upon the general assistance of others when we have complex challenges to deal with. To harness the power of a division of labour requires particular, and highly important, attitudes, talents and social skills. We need the wisdom of others, and so we need to learn how to facilitate sharing, in order to optimise our achievements and joy. This is because we are all connected and each an aspect of each other. Neither achievement nor joy is meaningful or even possible without the sharing of it. We can make the world our own – not only by developing our own capabilities but by learning how to enjoy those of others too. Self-knowledge is the key to unlock all the secrets of how to live. And we only come to know who we ourselves are by coming to know the depth and subtlety of other people.